Ok, it hasn’t technically been a year (Knowledge Graph debuted on May 16, 2012) but this week I wanted to revisit Knowledge Graph and how it has changed in 2012 and 2013. In the last year Google has made some improvements to the search function, including the addition of non-profit’s information. The slow roll out provides more information about non profit organizations right on the search page. Notably, the categories and tax deduction codes are included. Not all organizations have been included at this time, but Google is working to expand the list. In case call outs in search weren’t enough, Google has also expanded Knowledge Graph into movies on Android tablets. Prompted by facial recognition, the feature appears when media purchased within the Google Play store is paused. The greatest limitation to this feature is, obviously, its limited ability. IPad owners are unable to access the features, and they are only applicable to media purchased from Google. Curious about the miscellaneous actor on screen in the Netflix app? Too bad. You’re still going to have to look up his Wikipedia page for more information. 21st Century Problems, right? There are flaws, of course. Google isn’t perfect. The goal of Knowledge Graph is to predict searches intent and provide reasonable results. In the arena of “reasonable” they’re remarkably successful. Let’s say I’m searching for my favorite show between Kardashians seasons: Married To Jonas. I know I’m looking for the E! series. 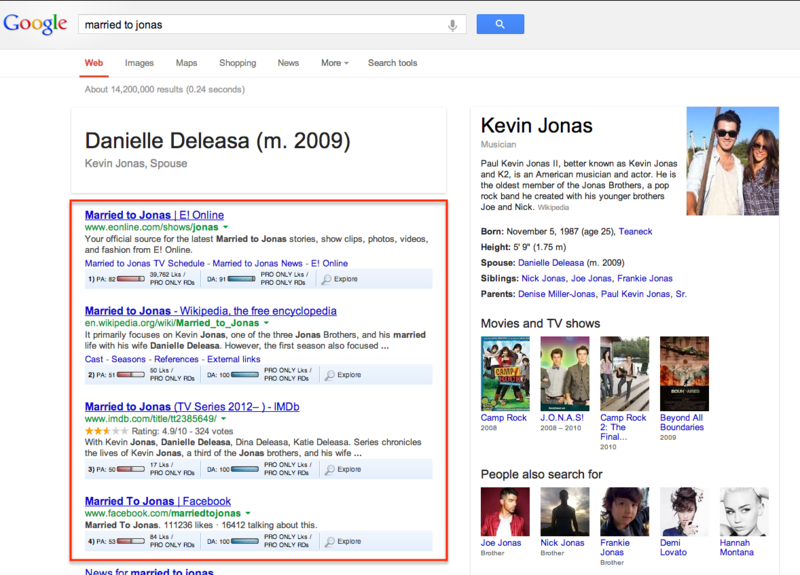 Google, on the other hand, evaluates the search as a question for Knowledge Graph purposes, and returns selections for both Danielle Jonas and Kevin Jonas as individuals. The organic results nail what I’m looking for with links to the series on E! and relevant social media sites. The series is not, however, mentioned in either of the Knowledge Graph selections. Short of knowing what exactly I was thinking when I typed the search Google carries out the results successfully. I’ll admit it, I’m nitpicking here. Overall, Knowledge Graph has made it easier to get information quickly, without filtering through a list of search results. The changes to the way we search will continue to evolve in 2013 with the use of both Knowledge Graph and Facebook Graph Search. Look for more information about Facebook Search next week!